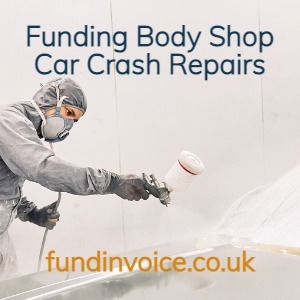 We have had a lot of success helping finance car crash repairers. We have assisted the full range of sizes from small companies to multi-million pound turnover companies. There are no minimum turnover restrictions on these types of facilities so even the smallest businesses can use this type of invoice discounting without the need to worry about minimum fees, or reaching minimum levels of turnover. Repairers are able to select the invoices they want to discount, so there is no obligation to use the service. Funding is typically at 100% of invoice values, less a small fee for using the service. Personal guarantees are not normally taken, only a warranty against committing fraud. For help call Sean on 03330 113622.